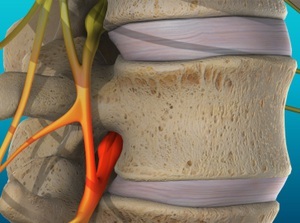 Between the vertebrae of your spine are soft discs. They allow your spine to twist and bend. They absorb shocks. But they can be damaged. If the soft center of a disc pushes through the disc wall, you have a herniated disc. This bulge can press against nerves in your spine.